Prescott hiking and backpacking is big. There’s not a major park that doesn’t include at least one or two trails, many leading up to Indian ruins or other exciting historical finds. Manzanita Outdoor has just about everything you might need for your next hiking adventure. Be sure to stop by to make sure you're prepared! This is just a small sampling of the hiking trails available in the Prescott area – be sure to investigate further for more! There are trails of most every length and difficulty, perfect for everyone on your trip. Always remember to pack plenty of water, a compass and map, and let someone know where you’re going before you head out on your hike. Where can I go hiking and backpacking? You will see Thumb Butte before you even get into Prescott city limits, towering over the downtown in the distance. Trailhead: From the downtown area, head up Gurley Street until it becomes Thumb Butte Road. Continue to the parking area, about three miles from the courthouse. A short hike with a great view of the surrounding mountains and towns and a wonderful opportunity to get up close and personal with ancient Indian runs. This trail is a great family trail – long enough that you get in plenty of talking and adventuring, but easy enough that most everyone can enjoy it. Trailhead: Head south on Mountain Vernon Avenue for about six miles, then turn right on Wolf Creek. Take a right turn on the dirt road next to Wolf Creek campgrounds; the trail crosses the road in less than half a mile. Amazing views of surrounding mountain ranges, deep valleys and immense boulders will greet you on your hike. Trailhead: Head north up Montezuma Street, which turns into Whipple Street and then go straight onto Iron Springs. Go for about six miles; the trailhead is a little over three miles ahead on ht west side of the road. I am looking for a hiking and backpacking guide. Start your exploration with the listings on this page. 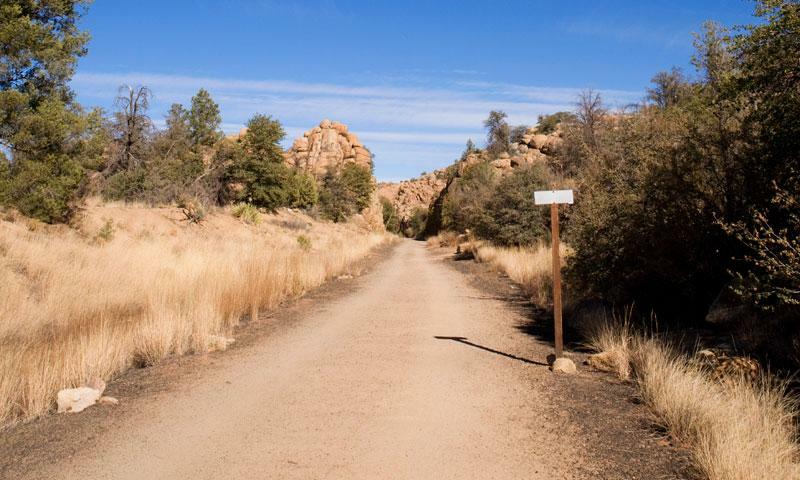 They’ll provide you with everything you need to know to get the most out of Prescott hikes.